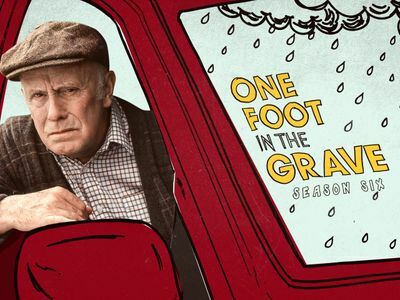 Here's where to watch every episode of One Foot in the Grave season 6. Mouseover or tap an episode to see where to stream it. Click or tap the play icon to stream it on the best available service. The Executioner's Song Oct 15, 2000 Victor has a new job as a window-cleaner. Meanwhile, Patrick's plans for a quiet birthday are ruined after an unfortunate misunderstanding involving a modern art painting and Pippa finds herself in an adulterous affair. Tales of Terror Oct 22, 2000 In Mr. Swainey's production of 'Nosferatu The vampire', the actor who was supposed to play the vampire doesn't show up so Nick asks Victor to take the part. He did. Later, blood was found in Victor's digestive system during a test - after fearing the worst, the doctors discover that the blood was from an undercooked black pudding that was earlier given to Victor by Mrs. Warboys! later that week, whie on their way to visit the dreaded Ronnie and Mildred once more, Victor and Margaret are shocked to discover that Mildred has killed herself while playing a game of 'Happy Families' - they are even more shocked to discover that her body is still hanging outside the house! The Futility of the Fly Oct 30, 2000 Margaret regrets hiring an attractive cleaner to help around the house. Meanwhile, Mrs Warboys has a couple of nasty frights. Threatening Weather Nov 6, 2000 During a power cut, Victor realises that he had been right through the middle of an area affected by a siege as it happened. Making the power cut worse, it occurs on a hot Summer night. Victor had the misfortune to have a light fitting drop right on to his privates, a cigarette stubbed out on his cap and a mysterious pain that leads him to think that he had been shot as he passed the siege that morning. Things were made worse by the arrival of the incontinent, fat and irritating elderly neighbour, Mr. Smedley. The Dawn of Man Nov 13, 2000 Victor's new fishing hobby leads to an unfortunate encounter with a fly-tipper. Meanwhile, a visit from Patrick's gay twin brother leaves Pippa feeling mentally and physically exhausted, especially when Patrick sits on a cork. Things Aren't Simple Any More Nov 20, 2000 In the very last episode of 'One Foot in the Grave', Victor's decision to attend a school reunion unwittingly delivers him into the hands of fate. Margaret deals with the aftermath with the help of her new friend, Glynis.